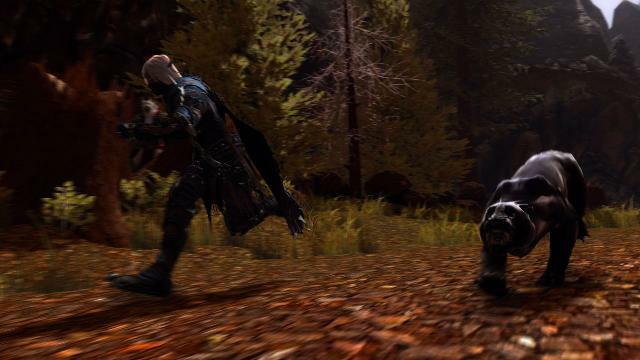 Perfect World Entertainment is about to start selling "Founder Packs" for their upcoming MMO Neverwinter (as [url=http://kotaku.com/5979599/neverwinter-b ... t:10xj02w3]reported by Kotaku[/url:10xj02w3]). By buying one of these packs you can get into the upcoming beta weekends (the first of which is February 8[sup:10xj02w3]th[/sup:10xj02w3]), though the first pack doesn't guarantee access. And of course each pack comes with extra goodies; the more you pay the more you get. Yes, that's right, for $200 buck you get to play Drizzt (or, technically, not Drizzt, but a character so close to Drizzt that they might as well be twins). Complete with panther companion (and spider mount for some reason). The question with that is what other backgrounds there are and what that actually means. In the end I suspect people will just ignore whatever the game tells them is up and just do their own thing anyway. Even if it has to be a black-skinned elf (so to speak). Stop thinking about it indeed. [[b:10xj02w3]EDIT[/b:10xj02w3]] Added the embedded video from YouTube. That was to be expected, ever since I saw the game it struck me as "Free 2 Play, Pay 2 Win". That's pretty much the case with every game made by Perfect World. Even the trailer on Kotaku says like "BUY IT NAO! GIVE US YOUR MONEYZ!!!" - no , just no. I refuse to pay ANY money to devs who treat their customers like this. I've never thought I'd ever say it but they are even worse than EA when it comes to milking people. I'll play the game when it comes out but ONLY if it's free 2 play with no monthly subscription. "Quit thinking about it and go GET your 'Hero of the North' founder's pack TODAY!" - that is pure INSOLENCE. Also, with the recent re-shift of focus on 'omg ebil' drow and Drizzt, I guess people must be tired of getting the same stuff over and over. There's free-to-play and there's free-to-play. One is actually free, giving you the full game while the microtransactions offer cosmetic items, while the other dangles a free-to-play hook in front of you but you'll have to pay and pay hard to get anywhere in the game past the start. Though I haven't played many games of theirs, I've got a feeling Perfect World is the latter. We'll see I guess. I'm happy to try the game (got a beta key for the second and third beta weekend when I got Torchlight 2) and we'll see how far we'll get without paying (and whether, on the off-chance, it's worth putting some money in. Though it has to be really good for me to break my boycott of WotC products). Neither am I, the game doesn't really stand much chance now that we have mmos like GW2 on the market. Guild Wars 2 is great. Just out of curiosity, are drow playable in this new MMO? "There are those who think, and those who dream. I, for one, refuse to choose between the two." -Liriel Baenre. More commonly referred to as Dark Elves, drow have characteristics similar to their elven kin, but can be easily identified by their midnight black skin. A matriarchal society, drow tend to live in the Underdark, where they serve their evil deity, Lolth. However, some drow choose to reject this way of life and flee to the surface of Faerûn, where they seek to show that not all of their kind is inherently evil. In my opinion the drow they show in the image next to that text looks like she's sick; skin [i:2lq16km4]way[/i:2lq16km4] too light and brown. But then most artists seem to get it wrong. Why is it so hard to understand "[url=http://th05.deviantart.net/fs71/PRE/i/2 ... g:2lq16km4]obsidian black skin[/url:2lq16km4]" (that's about the best I found with a brief search)? In my opinion the drow they show in the image next to that text looks like she's sick; skin [i:1a4a7khe]way[/i:1a4a7khe] too light and brown. But then most artists seem to get it wrong. Why is it so hard to understand "[url=http://th05.deviantart.net/fs71/PRE/i/2 ... g:1a4a7khe]obsidian black skin[/url:1a4a7khe]" (that's about the best I found with a brief search)? Well can't be any worse than the dark purple colored drow depicted in some of the 3.5 source books. That's kind of my point; they're all horrible. I think the mess up happens because of the fact that when you use obsidian black, it can be difficult to draw details. Or they're just lazy. One of the two. Probably, it also seems that in 3.5 Drow of the Underdark actually states that they can be a shade lighter or even have a violet-tinged when viewed under bright light. I do believe several of the forgotten realms books also state some thing similar, but I don't ever remember them being described that way in any of the second edition books. That leads me to believe they added that to make up for what you are talking about Alaric. That was the best you could find? 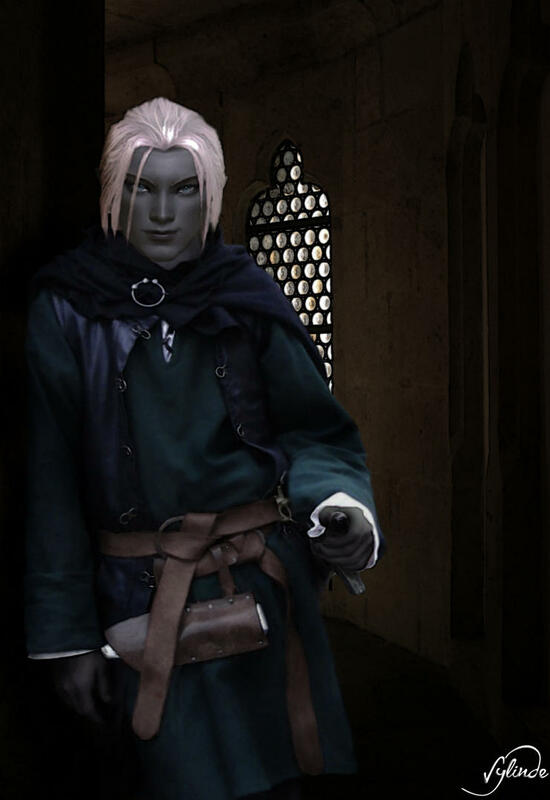 Look up Mavrosh's work on DA, and you'll see some REAL drow. (S)he doesn't call them that, but Helmouri instead, but they ARE drow. And so realistic, too! By far my fave drow artist on DA.